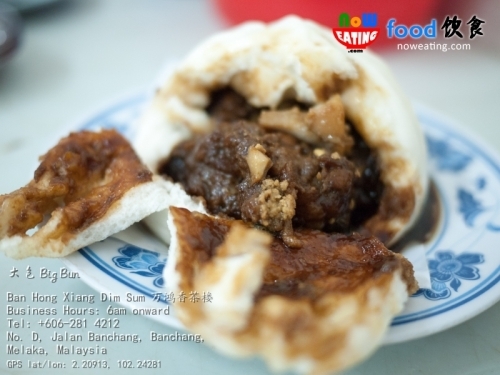 Note: Since 26-Mar-2014, Ban Hong Xiang is moving to 340, Jalan Kesidang 3/2, 75200 Melaka (Behind Petronas, next to Magnum) GPS: 2.213914, 102.239485. Our map is updated with latest location. What a juicy big bun 大包! The gravy flew out the moment I peeled the outer layer. In north region of peninsular Malaysia, you hardly see such a juicy Tua Pao ordered by almost every single table in a Dim Sum restaurant. Most people will get irritated after consuming half of it but for Ban Hong Xiang 万鸿香茶楼 in Melaka… one customer, one Tua Pao.